In this conclusion chapter, we have to explore the Indian conception of perspective. In the western vision, we will be unable to define any mistake in the factor of distance while watching any painting of Ajanta, but if we consider a few more times to watch deeply, then we can see something that would not comply with our usual concept. To make it clear, I have to preface an example. We should consider a covered pavilion contained pillars. If we extend those lines of that pavilion which goes to the horizontal border, we will see that those lines are meeting in several vanishing points. Besides this, the horizontal lines of the front side of that pavilion will convert to the diagonal lines, the lines of both sides will be more prominent, and moreover, spectators will easily be able to locate themselves based on those vanishing points. The above example we took from the western concept of perspective, however, a spectator while locating himself in the middle front of that pavilion, accordingly, the sidelines of that pavilion which goes to the vanishing point of the far back of that pavilion is too visible to that spectator! How does it possible? How could someone able to see two different viewpoints in the same angle? It is because the artists did not follow or copy the actual pavilion. Rather they depended on their imagination and moreover, they had the knowledge about the technique of multiple vision; finally, it produced the result of their artistic intuition and they just implemented it in their own discipline. We know very well about the multiple vision that came at the end of 19th century to the starting of 20th-century masterpiece paintings of Paul Cezanne, Van Gogh, and more; however, astonishingly in India, the techniques of multiple vision had been using before the Christ. 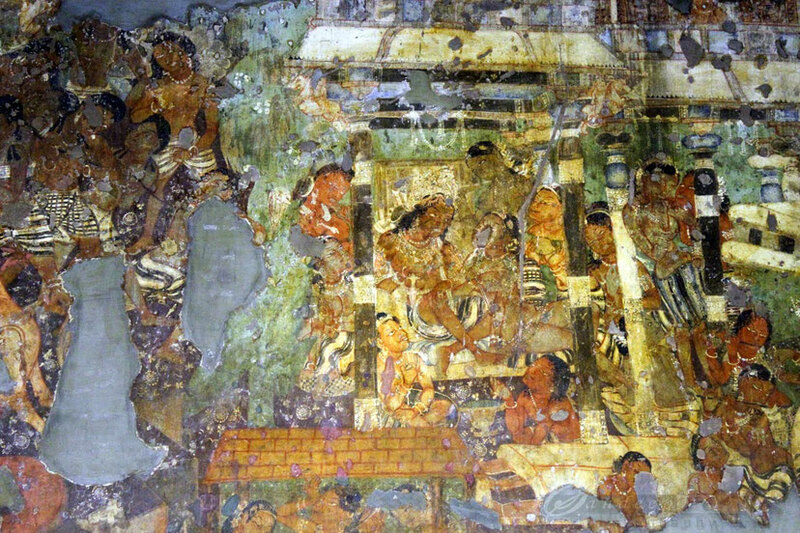 There is another technique of perspective had been using in that era we identified as “rotation perspective” and in Ajanta painting, we could find it in several compositions. To see this fantastic concept, we have to go to the number one cave. You can see two pavilions in the inner wall of that cave. The first part of that composition is related to the coronation of the prince Mahajanaka and in the second part, we will see his austerity. Ajanta cave painting from Mahajana Jataka. If you consider extending the lines of those pavilions, you will see that the lines of both pavilions are meeting in the two opposite vanishing points! As a result, you will find yourself in the inner side of both pavilions. Hence, after watching around the inner side of the first pavilion, you can easily move to the second pavilion, without transferring yourself physically! Such perspective noted as rotation perspective. In the oldest Osirian and Babylonian art, we can find the similar sense of perspective elsewhere. The notable fact is, Ajanta artists used this concept in very astonishing and significant way moreover, if they went ahead with their talent, it would comes very near to the modern concept of multiple vision perspective. In the conclusion, I would like to say that if we remember all the caves like Ajanta, Bagh, Vaja, Kanhari, Elephanta, Junar and so on, it will create an extraterrestrial world in our inner soul that will be similar to the poem of Kits where all the windows of the world of fairy women are opening serially at the far way of the ocean. After a while, it will take us to that everlasting world of joy where we have the flavour of our life and we will understand why we should take more times to live in this beautiful world. You just have completed all the chapters of discussion related to Ajanta cave painting. Now, it's your turn to express the experiences you have and I keen to know how you feel and what's in your mind. Feel free to share it below. Remember, knowledge is endless and I too have to learn from you. Thanks for your efforts.